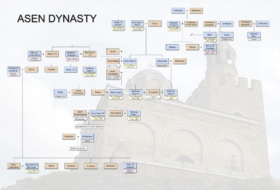 The Sratsimir dynasty descends paternally from the Asen dynasty. 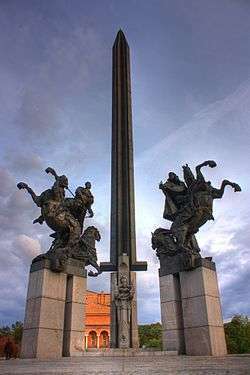 Cuman origin, as some of the names in the dynasty, including Asen and Belgun (nickname of Ivan Asen I) are derived from Cuman language. Pope Innocent III in his letter to the Bulgarian King Kaloyan (Calojoannes) in 1204 addressed him "King of Bulgarians and Vlachs" (Bulgarorum and Blacorum rex); in answering the Pope, John called himself imperator omnium Bulgarorum et Blachorum ("Emperor of all Bulgarians and Vlachs'), but signed himself imperator Bulgariae Calojoannes ("Emperor Kaloyan of Bulgaria"); besides, the archbishop of Veliko Tarnovo called himself totius Bulgariae et Blaciae Primas ("Primate of all Bulgaria and Vlachia"). Wikimedia Commons has media related to Asen dynasty. 1 2 Fine 1994, p. 12. ↑ Entangled Histories of the Balkans - Volume Three: Shared Pasts, Disputed Legacies Balkan Studies Library, Roumen Daskalov, Alexander Vezenkov, Publisher	BRILL, 2015, ISBN 9004290362, pp. 289-316. ↑ Madgearu, Alexandru (2014). Asăneștii. Istoria politico-militara a statului dinastiei Asan (1185-1280). Târgoviște: Cetatea de Scaun. ISBN 9786065372276. ↑ Wolff 1949, p. 178, 180, 185, 190, 198. ↑ The Cambridge History of Early Inner Asia, Volume 1, Denis Sinor, pg 279. ↑ Ion Grumeza, The Roots of Balkanization: Eastern Europe C.E. 500-1500 (2010), p.51. ↑ Fine 1994, p. 12–13. 1 2 Božilov, pp. 20-22.